The Lump Sum Grant is intended to help the County strike fraudulent voters from the rolls. 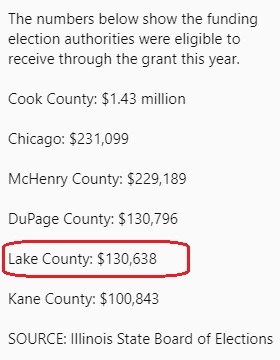 To be sure, at 130K it would seem that Lake County has more ghost voters that it has graves. But one veteran observer says don't be fooled by the numbers, look at the figures instead: "I don't think there are 130,000 ghost voters registered in Lake County. That works out to only one dollar per vote!" Local election authorities will lose more than $4.4 million in grant funds this year that pay for, among other things, purging ineligible names from voter registration rolls. Princess Nudelman did not return your LakeCountyEye's calls.